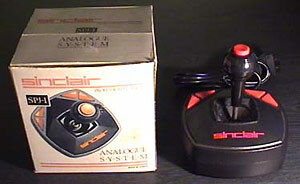 The SPJ-1 (probably Sinclair Personal Joystick) was produced to accompany Amstrad's unsuccessful Sinclair PC200. Unlike the digital SJS1 and SJS2 joysticks produced for the Spectrum +2 and +3, this was a fully-fledged analogue joystick, with potentiometers used to measure input (rather than switches as in its digital precessors). It was probably a rebadged PC-standard device. The SPJ-1 was, like its host machine, a flop, and today appears to be exceptionally rare.